The green teardrop is the location of Macy's at the Historic John Wanamaker Building; the two train stations are the SEPTA Regional Rail stations which are nearby. Christmas in Philadelphia has many beloved traditions - but two stand out above the others. The first, the older of the two, is the Macy's Holiday Light Show at Macy's Philadelphia - formerly John Wanamaker's, at 13th and Market Streets. And on the third floor of Macy's, since Christmas season 2006, has been the life-size, walk-around Macy's Dickens Village - A Christmas Carol, where you can lose yourself in the midst of the author's beloved classic, first published in 1843. This page is still under construction; please be patient as it develops... we're in the process of transitioning the text from Christmas 2009 to Christmas 2010. As you can see above, there are now individual links to pages on the Macy's Philadelphia location, as well as both the Light Show and the Dickens Village. For 2010, the Comcast Holiday Spectacular, which debuted in 2008, is all-new with a 3-D presentation, for its third Christmas run in the lobby of the Comcast Building, located at 17th and Arch Streets, right next to Suburban Station. Also, you can find our respective guides to December 2010 Things to Do in Philadelphia, which has both Christmas and non-Christmas events; Philadelphia Christmas 2010 Things to Do, which is solely dedicated to Christmas events; and finally, Philadelphia Black Friday 2010 Events Guide, as the Macy's attractions open on that day - Black Friday, November 26, 2010. The Light Show will be running from November 27, 2009, through December 31, 2009. 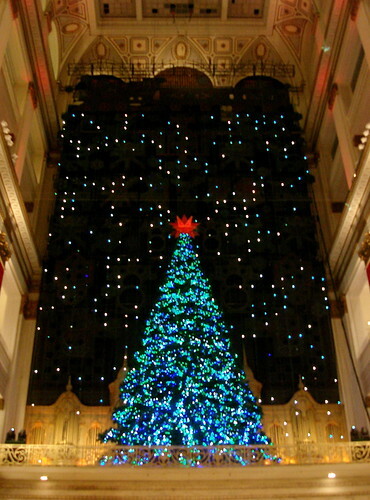 It is performed every hour, on the hour, at Macy's in the John Wanamaker Building. It is located at 13th and Market Streets, in Center City Philadelphia. The Light Show is an event of great prestige, and remains one of the most popular Christmas traditions of Philadelphia. A remarkable artistic achievement, the Dickens Village provides the visitor with the impression of wandering through Victorian London, while immersed in the events of the classic, beloved novel by the British author Charles Dickens, A Christmas Carol. New for Christmas 2009, were the flat screen televisions at the rope lines, permitting the Macy's visitor, if arriving during peak visiting time, to enjoy the light show in high definition. The figures in the village are animatronic, and remarkably lifelike, especially since they were first constructed back in the 1980s. They have undergone substantial renovation, which permits the master craftsmanship that went into their creation to shine through even more fully. Upon entering, you are shown a wall-sized map of Victorian London. You then are greeted by none other than a bearded Dickens himself, welcoming you to his live reading of A Christmas Carol. This is grounded in historical fact. Dickens loved the stage, was a frequent theatergoer, occasional actor, and reveled in the experience of dramatically reading his own works to audiences. In addition to his enjoyment of live performance, these tours were also very profitable to him, as Dickens did tours of various cities, much like a contemporary rock star, and with similar levels of popularity. When you enter, you feel as if you have entered Victorian London. In addition, there are many inside jokes scattered throughout the Village, which refer to Dickens's other works and to his personal life. For example, when you enter, you will see a M. Beadnell dressmaker sign: this refers to Maria Beadnell, the love of Dickens' life as a young man, but who opted not to marry him. On another side, is the King George and Vulture Tavern; another is a toymaker plugging the "Game of Elephant and Castle", a Victorian game. The first scene you see is that of Scrooge's nephew Fred, inviting Scrooge to Christmas dinner, and his cranky refusal. The second is that of the two gentlemen soliciting for donations for the poor, to whom Scrooge declines to participate. Next is the scene where Jacob Marley's face appears in the doorknocker, and there is a certain lifelike quality in Scrooge's reaction to the strange apparition. But perhaps the most impressively created scene, is that when Marley appears, full size, and with the "ponderous chain" of safes, money-boxes, etc., of his shared miserliness with Scrooge, scattered over Scrooge's bedroom. The most beautiful scenes, naturally, are those of the Ghost of Christmas Past. Each chapter (or as Dickens calls it, "Staves" of the book has a sign in Gothic Text above its archway. The one for the Ghost of Christmas Past is white, and when you enter it, you are immediately impressed by the purity, snow-white color of the scene, and what it evokes of Christmases gone by. You see Scrooge as a young clerk at Mr. Fezziwig's party, where the figures dance in the reels customary to the time. You see Scrooge's younger sister Fan (a nickname at the time for Frances), and learn that she, now deceased, was the mother of Fred. The Ghost first takes Scrooge to Fred's home, where he is introduced to the mirth and merriment that he misses every year as a result of his resolute opposition to Christmas. First, you see the den of thieves where Scrooge's personal effects eventually find a home (notice the animatronic cat poking its head out of a barrel on the left side). You then see the Cratchits mourning the death of Tiny Tim. Finally, you arrive at the graveyards, with Scrooge's name among the tombstones. A majority of the other tombstones contain puns and characters from Dickens's other works, such as Bill Sykes from Oliver Twist, and Edwin Drood - the subject of his final novel, which was not yet completed, when Dickens himself died in 1870. After Scrooge is scared out of his wits, the viewer then experiences his transformation the following morning. The morbid death scenes are replaced by Scrooge's elation that he does still have time to embrace the Christmas spirit. You leave seeing Scrooge reconciled to his family, and saving the life of Tiny Tim - and one feels very much in the Christmas spirit, oneself, after experiencing the Dickens Village. Please check back for more information, as this page is still under construction. If you'd like to leave Christmas in Philadelphia and return to the Home Page of Enjoying Philadelphia, please click here.